This is a super-bright diffused axial light. 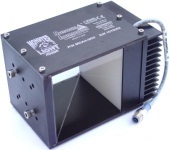 Built with Spectrum Illumination Monster LEDs, it delivers more light for high-speed imaging. Use this light to create even lighting on shiny and irregular surfaces. A beam splitter reflects the diffused light onto your part. Light reflected by your part passes through the beam splitter into your camera lens. The result is an image free of hot spots and shadows.